Teamviewer daemon is not running - Tried to install TeamViewer v12.0.71510 in Ubuntu 16.04 LTS 64bit two days ago. But there's a problem with the app, I mean TeamViewer won't running. I have uninstalled, purged, but it doesn't work. After searching for minutes finally I found the solution to fix this issue. Launched in 2005, TeamViewer focuses on cloud-based technologies to enable online support and collaborate in real time across the globe. Remote support, remote access, and online collaboration are not mere buzzwords. They represent helping people, better integrating technology into our daily lives, and creating new ideas. TeamViewer available for desktop including Chrome OS, Linux, Mac, Windows and mobile ( Android, iOS, Windows App, Blacberry ). 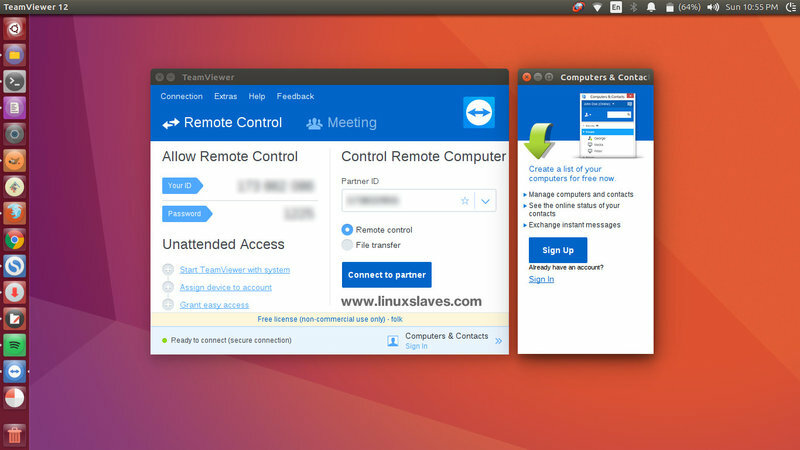 Step 4 - Head to its official site and get TeamViewer for Ubuntu / Debian package ( deb 32-Bit / 64-Bit Multiarc ). Step 6 - Now open the TeamViewer via Unity dash, or similar app launcher ( e.g synapse launcher ). It should run start and run normaly. You can change the gedit with your favorite Linux text editor like Nano, Mousepad, Sublime, Atom, and so on. That's I can write about fixing TeamViewer 12 won't run in Ubuntu 16.04 Xenial 64bit. Hope you've enjoyed reading this tutorial as much I’ve enjoyed writing it and thanks for visiting us!